Was the 2008 Status of Forces Agreement (SOFA) to withdraw US troops from Iraq by 2011 a good agreement? "The Status of Forces Agreement (SOFA) provides the legal basis for US-led troops to operate in Iraq after a wartime United Nations Security Council mandate expires at the end of December. The bilateral agreement essentially transforms the US from acting as an occupier - with sweeping powers to launch military operations, detain Iraqis, and bring equipment in the country at will - to having a more normal relationship with Iraq. Under SOFA, American forces are to pull back to bases outside Iraq's cities by the end of June 2009 and withdraw entirely from Iraq within three years. 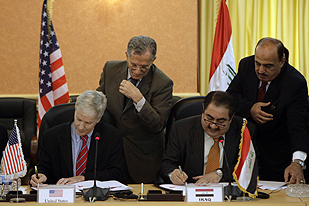 The security pact was the first such agreement since the invasion to outline specific terms for US involvement in Iraq. It was also the first in the region to be publicly debated and approved. Iraqi leaders backed the agreement after reassurances from President-elect Obama that his administration would not try to change the accord negotiated by the Bush administration..."
Taken together, these two agreements formalize a strong and equal partnership between the United States and Iraq. They provide the means to secure the significant security gains we have achieved together and to deter future aggression. They establish a framework for cooperation in the fields of defense, political relations, economics, trade, culture, education, the rule of law, health, the environment and science and technology." "If we compare the agreement to the [U.N.] Security Council order extending the permission for the presence of [foreign troops], the agreement is better for the Iraqi people because it has fixed dates for withdrawal." "...[The SOFA] is a very significant thing, and we need to start by putting this into context in two ways. First of all, understanding that this is more, this agreement is about more than the timetable for American withdrawal. What that timetable is embedded in, is an agreement that is about a strategic partnership between the United States of America and Iraq that is intended to develop over the long term to help us deal with common enemies that we face. And the number one common enemy that we both identify, both Americans and Iraqis, is al Qaeda. And Iraq has been committed to the fight against al Qaeda, remains committed to the fight against al Qaeda. And this agreement captures the intent of the Iraqi government to develop a partnership with us, and that’s an incredibly positive thing." "The party condemns the agreement that is prolonging the US occupation and warns of its grave consequences on Iraq's destiny in particular and the Arab nations in general...[Approval of the deal is a] collective sin perpetrated by the voters, the absent members and the abstainers against the Iraqi people and the nation." "Today is the day of Iraqi unity among Arabs, Kurds, all communities of Iraq, to reject the security pact. These people are coming out to prove the security pact is worthless." "The haste with which the Iraqi government and the Bush administration signed the deal raises many questions. Why now? Why couldn't the Iraqi government wait till Obama took the oath and sign the deal with the new administration in Washington? The Bush administration said the agreement had to be signed before the United Nations mandate for coalition troops to stay on in Iraq ended on December 31. The Americans fears [sic] a Russian veto or a double veto by Russia and China when the mandate comes up for renewal at the UN Security Council at the end of the year. ...[I]nstead of rushing through the ill-conceived SOFA, the Iraqi government should have told the Americans that they should try to renew the UN mandate at least by a few more months. Surely, the Russians and the Chinese are unlikely to oppose such an agreement. Let's assume for the sake of argument that there is a Russian veto. If that happens, the Iraqi government should insist on a short-term SOFA – say for six months – as it would give them room to discuss a fresh deal with the new US administration." "The agreement represents a stunning and humiliating reversal of course by the Bush administration, which had vehemently opposed any timetable for withdrawal from Iraq. For the last two years, President Bush has pretended that Prime Minister Nouri Al Maliki is a democrat and an American ally. In fact, Maliki is a sectarian Shiite politician who heads a government dominated by pro-Iranian religious parties. The U.S. presence now no longer serves the interests of Iraq’s ruling Shiite religious parties or their Iranian allies, so we are now being asked to leave. While U.S. withdrawal is made easier by the fact that both the Iraqi government and the new U.S. administration want American troops out, the confluence of events leading to the agreement underscores the folly of President Bush’s lost Iraq war."